The PCI20EX Series of cards from Contemporary Controls provide ARCNET functionality for the PCI Express (PCIe) bus-demonstrating a continuing commitment to ARCNET technology and customer requirements. 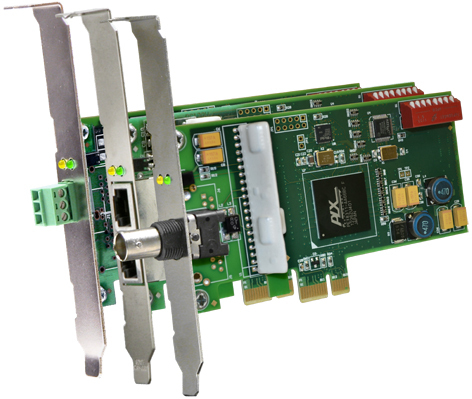 PCI20EX boards incorporate the COM20022 ARCNET controller chip which supports command chaining, sequential access to internal RAM, and duplicate node ID detection. Bus contention problems are minimized since the module's interrupt level and I/O base address are assigned through Plug-and-Play (PnP) operation. The PCI20EX Series supports high speed communications Using EIA-485 transceivers-DC-coupled and ACcoupled (transformer) variants. Conventional 2.5 Mbps dipulse signalling is also supported on the traditional coaxial and twisted-pair models. Each PCI20EX card provides two LEDs for monitoring network operation and PCI bus access to the unit. It is equipped with an 8-position, general-purpose DIP switch which could be used to assign the ARCNET node address. Ultimately, the node address is configured via software so the DIP switch can be used for special purpose userdefined configuration options.